Our Countdown to Easter Week 2 promotion starts today. 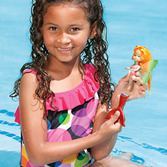 Take 20% off any water toy! These make great basket stuffers or gifts for all of those Spring birthday parties. Just say you received this email to get the discount. Buy as many as you want with this discount and feel free to forward this to friends. The more, the merrier!